The following is posted just for your information and does not represent the opinions of PeninsulaTeaParty.org, it's members or it's affiliates. Lyndon LaRouche: The British Empire's WW3 Plan Must Be Stopped This Weekend! American statesman and economist Lyndon LaRouche issued the following emergency statement on Thanksgiving evening, Nov. 24. "This empire is determined to set the nations of the world into a war with one another, which is intended that civilization as we've now known it, will no longer exist. This is not only a general prospect; this is the immediate situation this weekend. This is not a weekend like other weekends. We're now on the verge—and it's set in place right now—of a chain reaction, which could mean the extermination of civilization as we've known it. "Now this is being set up by the British Empire, and nobody else. And nobody else. If you don't think the British Empire is the enemy, you don't understand the ABCs of the situation. "A war now, do you know what it means? Do you know what thermonuclear weapons mean? Do you realize that what's going on in the Middle East, so-called, cannot be waged by anything other than nuclear weapons? This also means thermonuclear weapons? "So don't talk about this interest, or that interest. Don't try to take sides in the silly quarrels which people are indulging in in the Middle East and elsewhere today. Pay no attention to this. They don't have any reality except stupidity. If you try to win these wars, you lose everything. You have to prevent these wars from occurring, or you lose everything. "And the best example is to look at the study of the Seven Years War, from 1756 to 1763. And that war is the war that established the British Empire as the dominant imperial force on this planet. Because they induced the leading nations of continental Europe, and others, to make fools of themselves by fighting wars against one another, where the trick was, to get them to bleed themselves into weakness by fighting one another, and thus opening the gates for a British takeover, British imperial takeover, of the whole system. And that is exactly what happened. "The only thing that saved civilization in that period, was the struggle of the United States, to create the United States. This struggle began, formally, in about 1620. It came with the settlement—and tonight, this is Thanksgiving. What's Thanksgiving represent? A party, a feast, that was being held in what became Massachusetts, including one of my ancestors. I'm one of those people who has a ancestor when that occurred... but, on the Mayflower. "But out of that came the struggle which came out of the Massachusetts Bay Colony, which was ofthe same kind of character, and this established in the United States, the concept which actually was attributable to Nicholas of Cusa. And this concept being created, despite the crushing of Massachusetts, in the latter part of the century, despite that, it set into motion something that stayed in motion, effectively from 1620 through the establishment of our Federal Republic. "This is the only thing on this planet which has so far been able to cripple the attempts of the British Empire to realize the intention of becoming a new Roman Empire. "We're now at the point where the corruption of the United States, has reached the point, that if we don't beat the Empire now, in what it's trying to do, and what it's trying to do with nuclear threats right now, we're lost. Civilization is lost. "So the solemnity of our cause, the devotion to that cause, an understanding that it lies in our hands to think clearly about how we do avoid falling into the traps the enemy sets for us... And that's what should be on our minds. Because this is not something for the distant future. This is this weekend, this weekend. The plan is in place! It will set into motion World War III, right now. "I think we can beat that. But we have to be determined to do so. "So I think the element of solemnity at this occasion, ought to be taken into account. "What does our life mean after all? We're born, we die. What's important about our life is what we leave to the future of humanity." The pre-programmed "confrontation" which the British have set in motion around Syria and Arab League is still on track at the end of Friday. Syria refused to agree to accepting 500 "observers" which the Arab League demanded, and the Arab League is currently scheduled to have a meeting of Finance Ministers on Saturday, Nov. 26, and Foreign Ministers on Sunday, Nov. 27. A further set of sanctions and confrontations are then in store. In fact, there was no reason for Syria to concede to the Arab League demands, because concessions would do nothing to disrupt the British imperial game-plan. The Syrian military signalled as much today, when they issued a statement blasting "foreign elements" for carrying out terrorist operations against the military within the country. They report that ten of their personnel were killed on Nov. 24 by an attack on an air force base southwest of Homs. These are among a reported 120 members of the Syrian military killed by the opposition within the last month. Meanwhile Turkish Foreign Mminister Ahmet Davutoglu stated his country's intention to work closely with the Arab League in its action, even as the Deputy Prime Minister told a local TV network that "We won't send soldiers, won't intervene, and won't allow and created conditions for others to intervene." In fact, Turkey is totally sucked into the operation against Syria, as Lyndon LaRouche has emphasized. For example, the head of the self-styled Free Syrian Army is being safehoused in Turkey, whence he is calling for foreign air strikes on strategic targets in Syria. Chief Riyadh al-Asaad, in a telephone interview with Agence France Presse, also called for international protection, establishment of a no-fly zone, and a buffer zone. One of the next phases of the British set-up centers on the "humanitarian" card, which the French are already playing, in their call for a "humanitarian" zone out of control of the Syrian government. On Monday, an independent commission of inquiry which was set up in August by the UN Human Rights Council, to investigate violations of human rights in Syria, is reported by the media to be about to put out a report on the question of "crimes against humanity" by the Syrian military. A finding claiming such charges would feed the British imperialist "Right to Protect" fraud as a trigger for war. There is no way this conveyor belt for war is going to be stopped within the region. Only a solid hit at the British Imperial masters, and their puppet Barack Obama, will disrupt the game. Russian Foreign Ministry: Foreign Military Intervention in Syria Is "Absolutely Unacceptable"
As Arab League finance ministers met and called for new sanctions against Syria, and British-sponsored armed civil war continued inside the country, Russia yesterday made clear, in no uncertain terms, its opposition to not only additional sanctions on Syria, but also foreign military intervention. Russian Foreign Ministry spokesman Alexander Lukashevich told reporters at the ministry's weekly briefing on Nov. 25 that what is needed in Syria, instead, is internal dialogue. "We believe that the most important tasks now are the unconditional halt to violence, whatever its source, and the intensification of the internal Syrian dialogue on the issues of democratic reforms in the country," he said. He said outside military intervention was "absolutely unacceptable" and that "human rights issues should under no conditions be used as a pretext for interference in the internal affairs of states, in this case Syria." Meanwhile, rumors of an impending no-fly zone over Syria have been circulating since the UN General Assembly resolution condemning human rights violations in Syria was voted up on Nov. 22. Russia Today noted in a Nov. 24 report that, with the drive to topple Bashar Assad on "humanitarian grounds," the Libya scenario seems to be repeating itself. Turkey is ready to impose a no-fly zone over Syria, with American logistical support and with the possible participation of other Arab countries, as soon as the Arab League issues a decision, under its charter "calling for the protection of Syrian civilians, according to the Arab news service Al Bawaba on Nov. 22. The no-fly zone would include a ban on the movement of Syrian military vehicles, all with the supposed objective of preventing bombardment of Syrian cities. It should be noted in this context that Turkish Foreign Minister Ahmet Davutoglu will be in Cairo for the Arab League foreign ministers meeting on Nov. 27, which will take up the proposals for restrictions on airline flights and on trade and banking transactions with Syria, coming from today's meeting of finance ministers. Though the Turkish Ministry of Defense has denied that it has any interest in invading Syria, Russia Today reports that "critics fear that, much as in Libya, the West will use the framework of humanitarian intervention to justify a full-scale invasion of Syria"—which is of course exactly the British gameplan, backed by their stooge Obama. According to high-level Russian diplomatic circles, the deployment of three Russian Navy ships to the waters off the coast of Syria is intended as a war-avoidance deployment. Efforts to convey Russian concerns about a pending military attack on Syria to overthrow the Assad government have fallen on deaf ears both in Washington and at NATO headquarters in Brussels. So, the Russian government decided that they would send Russian ships into harm's way, betting that saner heads in Washington will not want to risk starting a strategic confrontation with Russia, that would almost guarantee a thermonuclear World War III. Informed of the Russian strategic war-avoidance effort, Lyndon LaRouche commented yesterday that the Russian actions will give senior U.S. military commanders, who are unanimously dead-set against another armed conflict in the region, the added needed leverage to push back against Obama's insanity and British desperate efforts to get the war going. Nevertheless, given the state of hysteria inside the British oligarchy, the Russian move does bring us potentially on the edge of nuclear war—this weekend. 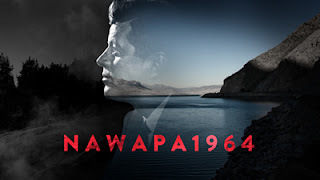 The LaRouche Political Action Committee (LPAC) has just released a new feature film, NAWAPA 1964, the never-before-told story of the fight for the North American Water and Power Alliance (NAWAPA), a grand, continental water management plan born of the Great Projects optimism of the Kennedy era. Proposed after years of study by the Ralph M. Parsons company only months after Kennedy's assassination, NAWAPA found its most ardent champion in Utah Democratic Senator Frank E. “Ted” Moss, who chaired a special Subcommitte on Western Water Development to specifically study the plan. Beginning in August 2010, LPAC put NAWAPA at the center of an organizing drive for a recovery of the American economy. A number of detailed policy videos were produced on the design of the project, in the context of an integration with complementary measures such as high-speed rail, advanced nuclear reactors, and new city building. An informal builder's committee was recruited from among the ranks of skilled engineers and construction experts from around the country, who offered their appraisal of the feasibility of the project through video interviews and presentations at several regional NAWAPA conferences hosted by LPAC. It was out of this organizing effort that NAWAPA 1964 was born. Using material drawn entirely from Moss' Senate correspondences, as well as newspaper reports and rare archival footage, the hour-long film dramatizes the shift from the technological optimism of the early 1960s, to the subsequent moral decay of the Vietnam War years from the vantage point of Moss' efforts to implement what would have been the greatest engineering project in history. Why, then, was the project never built? This is the question that the filmmakers hope to evoke among patriots who today recognize how profoundly the United States has lost touch with its historic mission in service of great projects, but who also know that great ideas—like NAWAPA—never die, as long as there are people willing to fight for them.